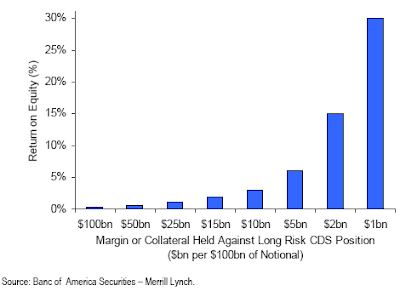 As a side note, this stuff upsets many readers: Merrill/BofA discussing CDS regulation!!? So take it with a grain of salt. But before you listen to more angry, paranoid verbal diarrhea from bloggers and commentators online, read this as well as other materials. Remember, bloggers out there often try to infuriate rather than inform, to make you come back and click on their ads. Don't automatically buy it (including stuff posted here). Check the facts. Think for yourself. A section in the paper touches (as an impetus for derivatives regulation) on AIG Financial Products (AIGFP), the derivatives sub of AIG that brought the whole firm down. Most assets they held were marked down, but the number circled in red was the real culprit (other stuff actually did OK this year). It's the CDS protection on the" AAA" tranches of "multi-sector" CDOs. A significant portion of that protection was written on sub-prime CDOs (CDO's whose collateral consisted of junior tranches of sub-prime ABS - confusing enough yet? ), or on CDOs containing partial sub-prime exposure. The $30+ billion "Fair Value loss" number represents the unrealized losses on these positions in September. Note that by the end of last year those losses were realized (plus much more) as AIG unwound these trades with some dealers. On another side note, unwinding at ridiculously distressed levels was a bad move. The US government as the newly proud owner of AIG should have negotiated with the protection buyers. If these negotiations had been even close to the type of settlement that took place with the Chrysler creditors, the taxpayer would be in decent shape now with respect to AIG. Why the two firms (Chrysler and AIG) were treated so differently is a source of much debate, but this is exactly why the government should not own private companies. Their approach to negotiations is arbitrary, often driven by political pressures/ populism, producing an outcome which is rarely in the best interest of the taxpayer (the shareholder). In our view, this error in loss estimation which led to insufficient margin or capital at AIGFP stands as the fundamental source of AIGs failure. If AIGFP projected higher losses or a regulator had demanded more capital regardless of their internal loss assumptions, the company would have been less incentivized to enter into such a large positions as the projected return on investment would have been lower. Even if they had done such large size, the company would have had more funds to apply to the losses. What's sad is AIGFP made only 30 basis points on much of the protection they had written. The chart below shows how you can turn 30 bp into 30% return - using leverage. Posting only 1% in margin (or allocating 1% capital) allows you to leverage 100:1. At an even slightly higher margin (or capital) requirement, the returns would have been much lower and AIG would not even have been in this business. That's why you never see hedge funds writing massive amounts of CDS protection - for them it's highly capital intensive. The 4 regulators that oversaw AIG didn't see this problem, and the protection buyers didn't ask for much margin because AIG was "AAA". From the regulatory perspective it's a simple problem to solve. As a regulated institution, when you buy protection, ask for a proper amount of margin. When you sell protection, allocate appropriate amount of capital.